30/09/2014: REXEL 3.5 HAS BEEN RELEASED: REXEL allows to define the design spectra according to the Eurocode 8, the new Italian Building Code or completely user-defined. Based on these spectra, the software allows to search for sets of 1, 7, or 30 records compatible, in the average, with them. Records may also reflect the seismogenetic features of the sources (in terms of magnitude and epicentral distance), ground motion intensity measures, and soil conditions appropriate to the site. The datasets contained in REXEL are the European Strong-motion Database (ESD), the Italian Accelerometric Archive (ITACA) (for a table of matching between ITACA records and the accelerograms IDs in REXEL see here), and the Selected Input Motions for displacement-Based Assessment and Design (SIMBAD). For details about updates and a track of changes of older versions see the change log. 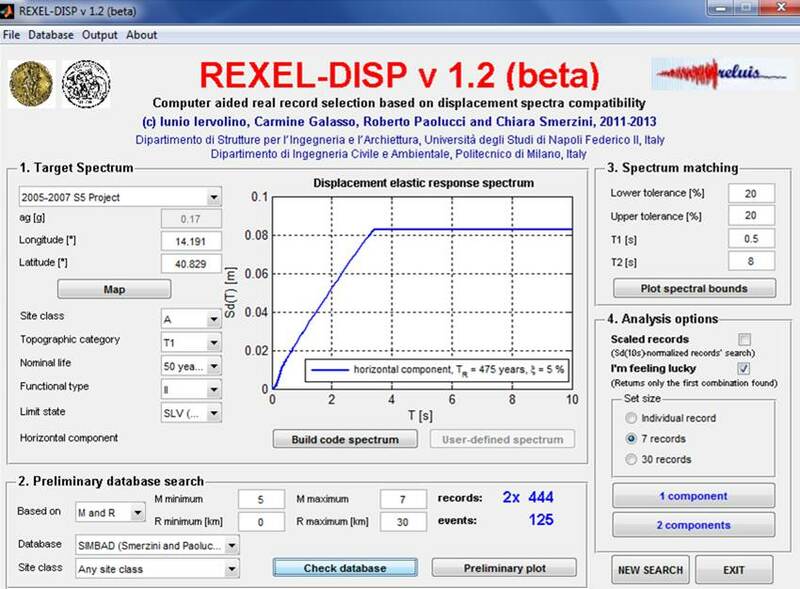 31/01/2013: REXEL-DISP - REXEL-DISP 1.2 beta HAS BEEN RELEASED. REXEL-DISP allows to select suites of natural accelerograms compatible with displacement spectra of NTC '08, EC8, deriving from an ad-hoc hazard analysis of INGV-DPC S5 research project, or user defined. Records contained in REXEL-DISP are those of: Selected Input Motions for Displacement-Based Assessment and Design (SIMBAD). REXEL and REXEL-DISP were developed in MATLAB environment; for its use the MATLAB Component Runtime (MCR) 711 is required. Please launch preliminarily the MCRInstaller.exe file and follow the instructions of the installation procedure. REXEL requires a specific version of MATLAB. If you have a different version of MATLAB, REXEL will not work; for this reason, you must install the MCR. It is recommended to restart the computer after installing MCR. The MATLAB Component Runtime is a free redistributable that allows you to run programs written in a specific version of MATLAB without installing the MATLAB version itself. There is no harm in having MATLAB and the MCR installed simultaneously, or in having multiple versions of each one installed. The first run of REXEL may take some minutes, please wait patiently, it works! Footnote 1 (for Windows Vista and Windows 7 users): May be some problems in running REXEL (and REXEL-DISP) after install on computers using Windows Vista or 7 (or later versions). In fact, it may be required to disable the the "user account control" (UAC) features. To do so right-click on the REXEL .exe file, then choose properties and disable the UAC. After that REXEL should run without further problems. More easily it is possible to right-click and select to run as an administrator in the context menu. Footnote 2: On some operating systems the computation of deviations in REXEL may be especially slow. In any case the software is optimized for Windows XP. Footnote 3: Please recall that REXEL returns records in m/s^2 units. IMPORTANT: IN THE CASE THE COMPUTER YOU USE HAS 64BIT MICROSOFT EXCEL, IT IS NECESSARY TO INSTALL REXEL AND REXEL-DISP IN THE SAME FOLODER OF MICROSOFT OFFICE, THAT IS "PROGRAMS", NOT IN "PROGRAMS (X86)" WHERE WINDOWS WOULD PUT REXEL AND REXEL-DISP BY DEFAULT. DISCLAIMER: REXEL and REXEL-DISP may be used and distributed for free while their modification and commercialization are not authorized. The authors have made every effort in order to ensure the accurate working of the software; however, any responsibility is declined for wrong results. Iervolino I., Galasso C., Cosenza E. (2010). 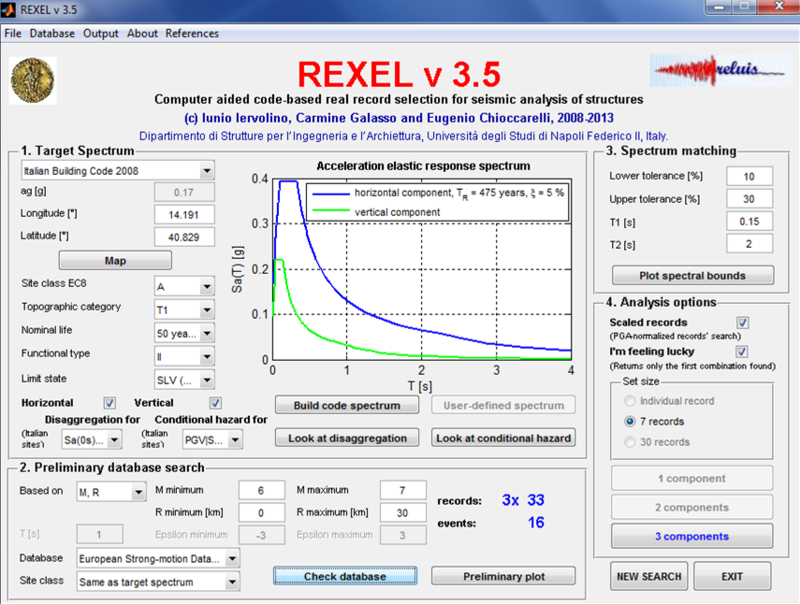 REXEL: computer aided record selection for code-based seismic structural analysis. Bulletin of Earthquake Engineering, 8:339-362. DOI 10.1007/s10518-009-9146-1. Iervolino I., Galasso C., Cosenza E. (2009). Spettri, Accelerogrammi e le Nuove Norme Tecniche per le Costruzioni. Progettazione Sismica, Vol. I(1): 33-50, Gennaio-Aprile. Smerzini C., Galasso C., Iervolino I., Paolucci R. (2012) Engineering ground motion selection based on displacement-spectrum compatibility. Proc. of 15WCEE, Lisboa, PT. Paper No. 2354. Iervolino I., Chioccarelli E., Convertito V. (2011) Engineering design earthquakes from multimodal hazard disaggregation, Soil Dynamics and Earthquake Engineering. 31(9): 1212–1231. Iervolino I., Maddaloni G., Cosenza E. (2009). A note on selection of time-histories for seismic analysis of bridges in Eurocode 8. Journal of Earthquake Engineering, 13 (8):1125-115. Iervolino I., Maddaloni G., Cosenza E. (2008). Eurocode 8 compliant real record sets for seismic analysis of structures. Journal of Earthquake Engineering, 12(1):54-90. Iervolino I., Cornell C.A. (2005). Record selection for nonlinear seismic analysis of structures. Earthquake Spectra, 21(3):685-713. REXEL and REXEL-DISP are licensed under a Creative Commons Attribuzione - Non opere derivate 3.0 Unported License. Based on a work at http://wpage.unina.it/iuniervo/.